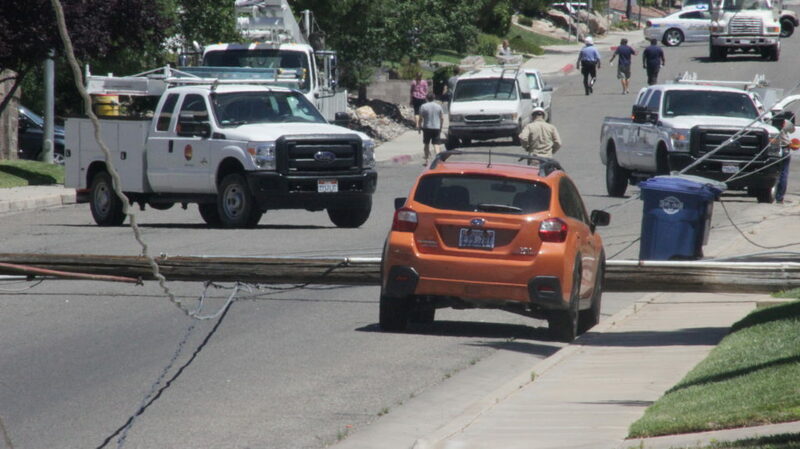 UPDATE: At approximately 3:30 p.m., Marc Mortensen, assistant to the St. George City Manager, notified St. George News that it would be closer to 6 p.m. before full power was restored. 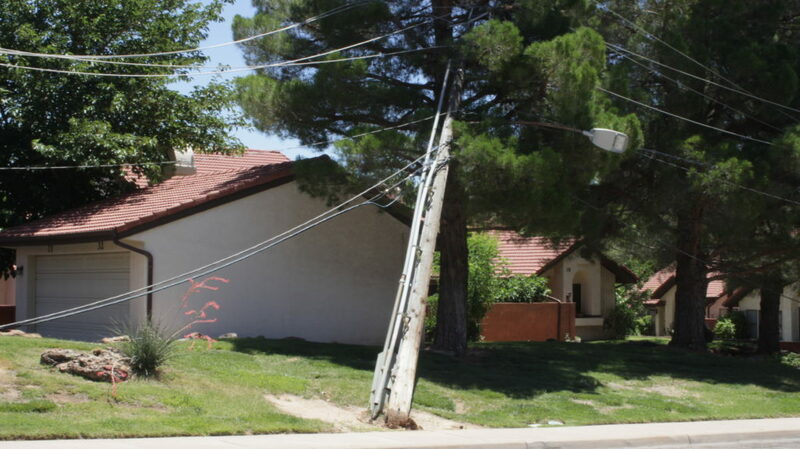 In addition, two more poles have been replaced, making a total of seven power poles. Mortensen said he was thankful the city had the resources to dedicate to this massive project, essentially putting in two blocks worth of power utilities in one day. Mortensen added that they were able to get two portable HVAC units to the Ridgeview Gardens of St. George assisted living facility and that they brought in generators to run them. He also thanked the community for their help with residents and workers on such a hot day. “People have been great to our city residents and crews,” he said. ST. GEORGE — A tangle between a furniture truck and cable line Friday led to a power outage and road closures on 1200 East in St. George. 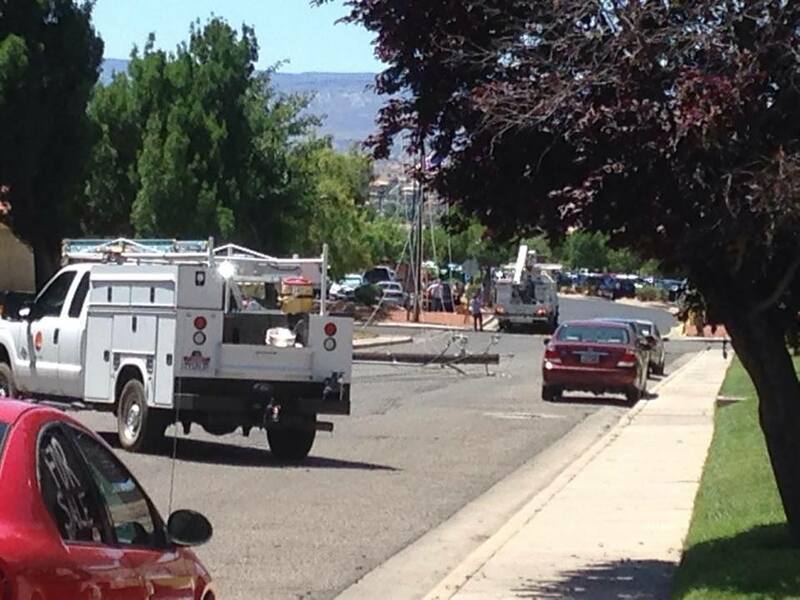 Just before noon, St. George Communications Center received notification of power lines in the road and multiple downed power poles. 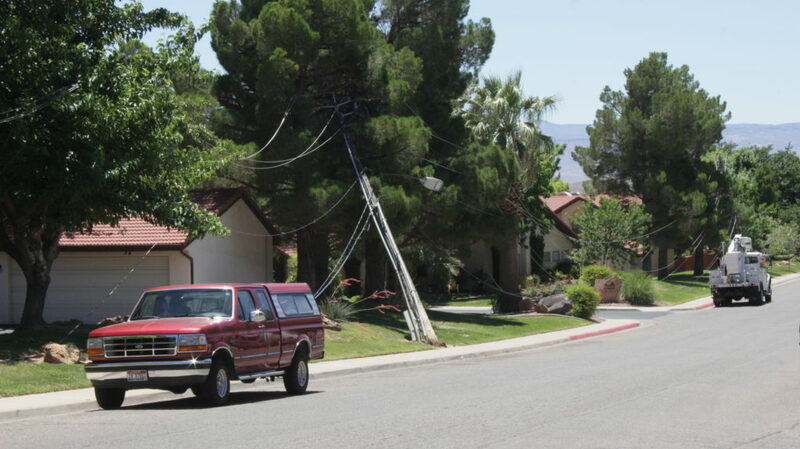 Marc Mortensen, assistant to the St. George City Manager, told St. George News that just before noon, a furniture truck snagged a low-hanging TDS Telecom cable line. The driver of the truck drove approximately 80-100 feet before realizing what happened, Mortensen said. Crews arrived on scene and set up a hard closure on 1200 East from 200 South to 400 South while repairs were being made. “We’ve got multiple crews, energy services as well as water crews, to dig holes and get new poles set,” Mortensen said. Thomas Fierro, records specialist for SkyWest Airlines, was at his desk when the power went out in the building. 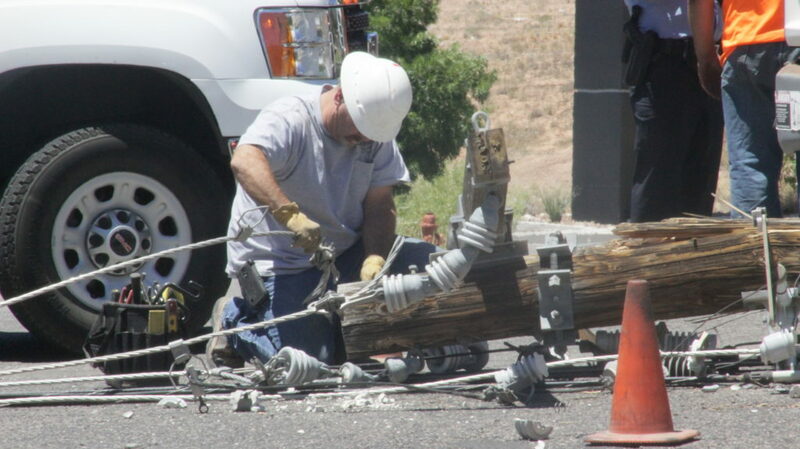 When he and other employees came outside, they discovered the power lines had come down in the street. 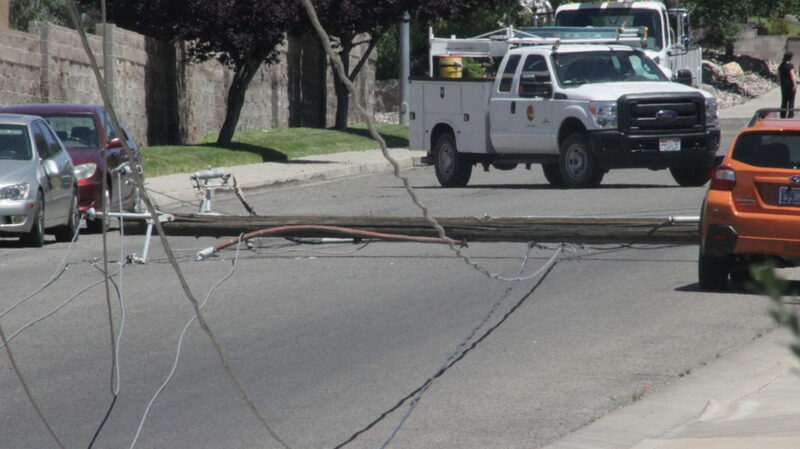 Power was rerouted and restored to the largest customer affected by the incident, SkyWest Airlines; however, Mortensen said some additional businesses and residents in the vicinity would experience longer power outages while the poles were replaced. 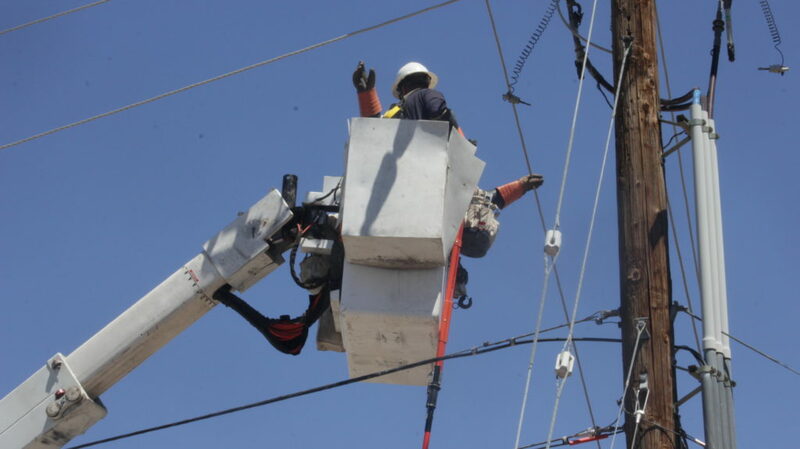 Approximately 200 customers were affected by the outage. 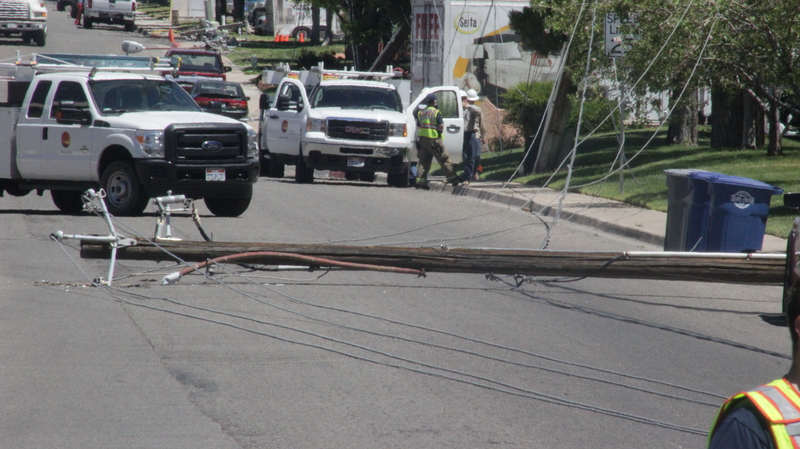 At 1 p.m., Mortensen estimated a two- to three-hour time frame before power would be restored to all customers. Power is currently out from Interstate 15 to River Road and 400 South to 200 South. Mortensen said their primary concern at this point is restoring power to Ridgeview Gardens of St. George, an assisted living facility that doesn’t have backup generators. Some access will be available to local traffic, Mortensen said, but other traffic is being rerouted. No one was injured in the incident, which Mortensen said was fortunate in light of the extent of the damage. That’s what happens when you have some RealLowlife dumbob driving a truck. LOL ! Well here comes a furniture sale to help pay for legal expenses ! So was the driver cited? This will cost Blvd Home Furnishings a pretty penny! Yikes, maybe Blvd should employ smarter drivers/delivery people. Not surprising, I see these delivery trucks from Boulevard Furniture, driving like maniacs all the time, around this entire area. How the devil can anybody driving anything not realize there is a problem there when their vehicle starts jerking around from hitting overhead lines? I hope this guy is looking for a new job now. And TDS certainly shares a lot of the blame here, for having their cable under height. I imagine it’s going to cost both Boulevard and TDS a pretty penny when all is said, done and the bills are sent out. Both companies are extremely lucky there were no injuries or fatalities from this mess. oh well, time to look for further employment. 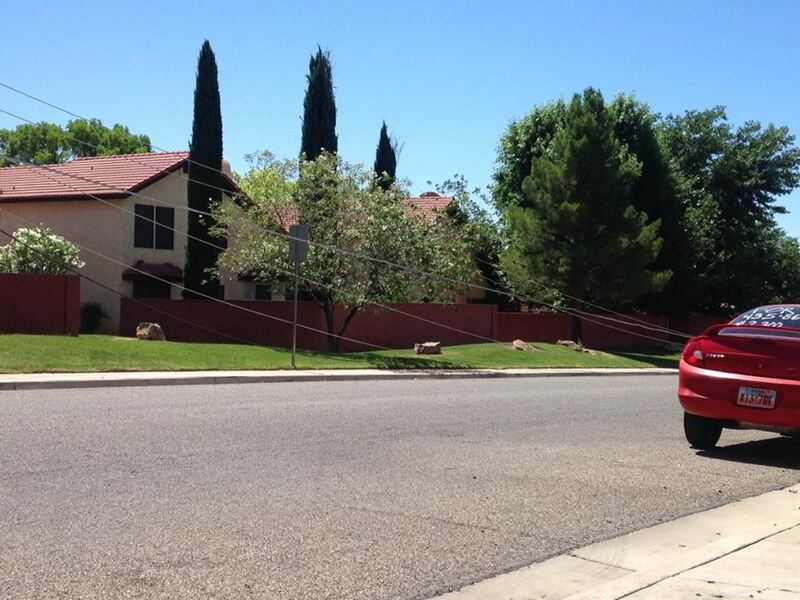 Do we know if the truck driver was at fault, or if the low hanging TDS line was simply hanging too low? Seems to me like it is obvious that the TDS line was hanging too low. But it is also obvious, that the driver of a vehicle, particularly a commercial vehicle is responsible if that vehicle hits anything. Low hanging lines, branches or anything else are something that any good vehicle operator is going to be aware of. 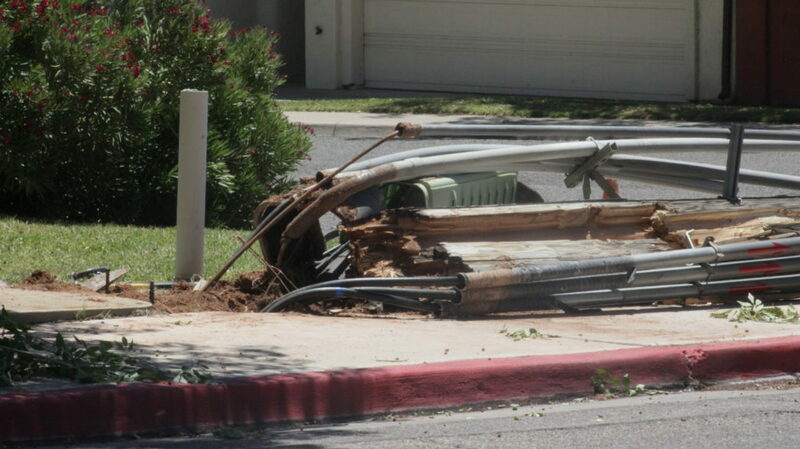 perhaps the truck hit bump from road gutter crossing and caused the truck to bounce really high and it started catching lines and it just snowballed from there, or maybe its the crumbling saint george infrastructure just slowly sagging to the ground. another example of failing infrastructure would be redoing the roads without any thought of the road grade becoming higher, so when the monsoons come the water goes into everyones home instead of draining into the streets.